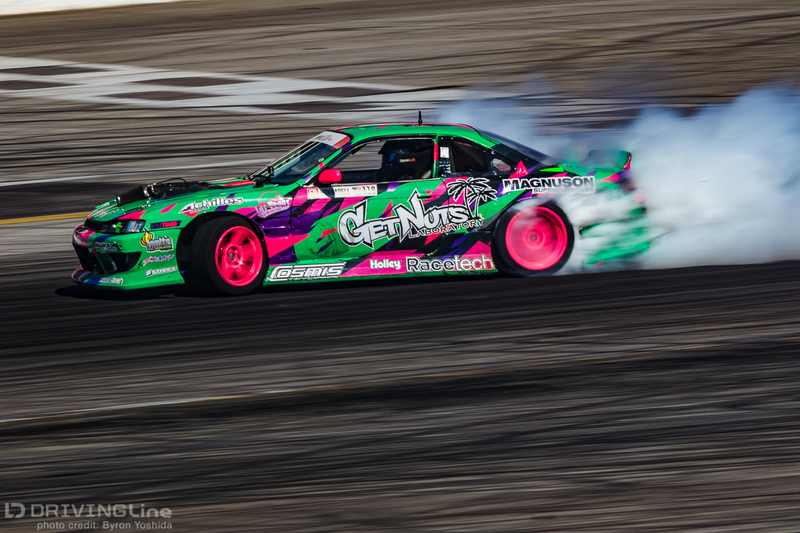 Irwindale Speedway has become hallowed ground for the sport of drifting. Home to the first professional competition in the US back in 2003, the track has hosted the season finale for Formula Drift for all 12 seasons to date. Unfortunately, the land that the track currently leases was sold a few years back, and this may be the last year before the track is demolished in favor of a shopping mall. While talk of demolition has been occurring almost annually since the sale was made in 2012, the permit changes necessary to move forward with the demolition finally happened earlier this year and have essentially paved the way for this season to be the final season of motorsports at the House of Drift. 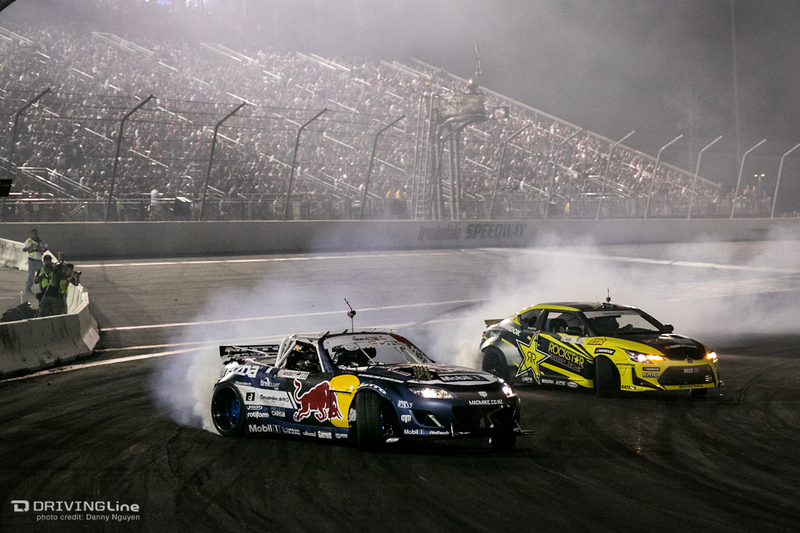 For 2015, Formula Drift altered the layout slightly to encourage a longer wall-ride on the ‘inner bank’. Drivers start near the exit of burn 2 in the traditional oval track layout, heading counter clockwise around the ½-mile bank, initiating into drift just before turn 3 in the traditional layout. Continuing around the big bank, drivers come off the bank at the exit of turn 4 and transition in front of the main grand stands for a clip on the traditional start/finish line facing the crowd. From there, the drivers transition again and continue the course through the inner 3/8-mile bank again in the counter clockwise orientation. Historically, drivers only drifted around half of the inner bank before sliding through the infield, but this season’s layout extends the course through the entirety of the inner bank along the wall then sliding through a decreasing radius turn into the infield in the same portion of the track, with one final inner clip before the finish line. This layout was enough of a change to force the drivers to re-learn what the judges were asking for, particularly after the switch-back across the traditional start/finish line. Friday’s qualifying round was delayed for awhile midway through due to technical issues with both the livestream and instant replay system. In the end, Forrest Wang laid down the best run of the day scoring 89 points out of a possible 100. 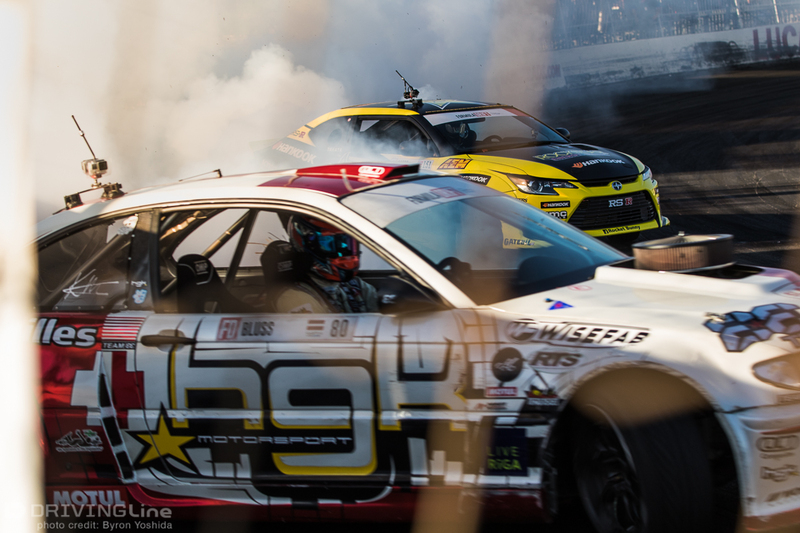 Matt Field and Ken Gushi tied with matching scores of 86, Field earning the higher qualifying position due to a higher score from the designated style judge. “Mad” Mike Whiddett pushed his RADBUL Miata to a fourth place qualifying effort, while Fredric Aasbo rounded out the top five qualifying positions with a score of 83. Championship contenders Ryan Tuerck and Chris Forsberg were statistically eliminated by means of Aasbo’s top 32 qualifying effort. Here’s a look at how the tandem action finished the season in Irwindale. Fast forward to the Ford Top 16 or Nitto Final 4. Wang Lead: Wang initiates nice and early and dumps a ton of smoke through the entire big bank, Stoneback has shallow angle through the bank and is running a lower line. Wang has this track figured out and is proving why he was the top qualifier. Stoneback is struggling and appears to be down a bit on power. Stoneback completely loses drift entering the inner bank and drives straight through the second half of the course. This may indicate transmission issues. Stoneback could use his competition timeout, but whatever he’s having issues with appears to be terminal as he has excused himself from the competition. Wang will move on to the Top 16. Yokoi Lead: Yokoi has a good line on the bank, Landreville has a slightly lower line but good angle and proximity. As the cars transition across the start finish line, Landreville closes the gap quickly and taps Yokoi lightly. Yokoi stays on the throttle and finishes the course with good angle and smoke. Landreville is off the line near the final inner clip, but overall a good line. Landreville is likely at fault for the contact and Yokoi would be allowed as much time as needed to repair any possible damage.Landreville Lead: Landreville opens up a good lead on the big bank, but Yokoi dives in hard after the mid-bank transition. Yokoi may have tapped Landreville, but both drivers maintain drift. Yokoi has great proximity and keeps aggressive pressure on Landreville through the inner bank. Landreville is dragging his bumper through the inner bank, confirming that Yokoi did barely tap Landreville. The fact that Yokoi didn’t disrupt Landreville’s drift really shows his skill level in tandem. Yokoi gets the win, one judge voted for a “One More Time” (OMT). Foust Lead: Foust enters as prescribed into the big bank, Nishida is several car lengths back and has a bit lower line and shallower angle through the entirety of the bank. Nishida closes the gap a bit through the transition into the inner bank, but Foust has a great line and plenty of tire smoke, likely earning the advantage.Nishida Lead: Nishida has a much better lead run, still on a slightly lower line on the bank but with better angle and good tire smoke. Foust closes the 3-car gap a bit as they transition into the inner bank and has a slight steering adjustment as the car stabilizes on the inner bank. Nishida is a bit wide on the last inner clip again, but Foust is close in chase. All three judges vote for Foust to move on to the top 16. Forsberg Lead: Savage is unable to make the call for this tandem battle, so Forsberg takes a solo pass and moves on to the top 16 unopposed. Forsberg makes a full pass to give the fans a proper show. Whiddett Lead: Shortly after “Mad” Mike Whiddett initiates, the car slows dramatically and Evans has to adjust, but Whiddett stomps the gas pedal and continues a good high line through the big bank. Evans isn’t far behind through the big bank and closes the gap a bit heading into the inner bank. Whiddett has good tire smoke and a good line through the inner bank and through the final inner clip, Evans is a bit off line due to taking a shallower line through the inner bank to try and catch up to Whiddett.Evans Lead: Evans is a bit smoother initiating into the big bank than Whiddett was, but Whiddett is hot on his tail. Evans doesn’t have a bad line or many steering adjustments, but Whiddett is only a few feet away from Evans at all times. Whiddett continues to put the pressure on Evans through the entirety of the course and shows good consistent proximity. All three judges vote for Whiddett to move into the Top 16. Tuerck Lead: Tuerck has a solid lead run, Grunewald is 3- to 4-car lengths back through most of the bank on a slightly lower line. Grunewald closes the gap through the switchback in front of the main grandstands, Tuerck continues to run the high line on the inner bank with plenty of tire smoke. 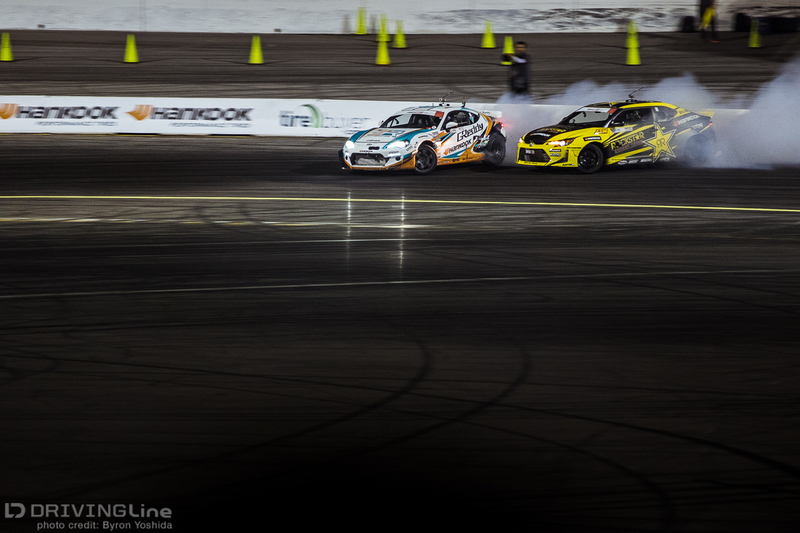 No major mistakes from either driver, but Tuerck definitely looks like he had the better line. Likely a slight advantage to Tuerck entering the second run.Grunewald Lead: Grunewald has a good line through the big bank, Tuerck takes a bit lower line with slightly shallower angle, but with good proximity. This looks like an almost identical run to the first one, albeit Tuerck is a bit closer to Grunewald. Grunewald continues through the inner bank smoothly and with good smoke, Tuerck’s pressure is exactly what the judges want to see. Two judges vote for Tuerck while one judge votes for a OMT. Aasbo Lead: This is for all the marbles! If Aasbo wins this tandem battle he will take the championship. Aasbo has a good initiation, Bluss is very shallow through the first part of the big bank. He finally gets at full lock midway through the bank, but is slow to transition through the transition near the traditional start finish line and punts the clipping point mid-bank. Bluss continues with shallow angle through most of the inner bank, finally closing the gap near the final inner clip. Aasbo likely has an advantage after the first run.Bluss Lead: Bluss has a good high line, much better angle than in his chase run. Aasbo is sitting two cars back through most of the bank, possibly a bit conservative. Bluss has a much better line through the mid bank transition, and continues strong through the inner bank. Aasbo closes the gap a bit on the inner bank, then Bluss spins unexpectedly coming off the inner bank near the final inner clipping point. Aasbo tries to slow but is unable to and hits Bluss’s car. This will likely be Bluss’s fault. Judges vote unanimously for Aasbo, Aasbo has now clinched both the FD USA and the FD World championship by surviving his Top 32 battle. Amazingly, Daigo Saito has never lost a tandem battle at Irwindale, a win streak of 15 tandem battles spanning three years. If he wins the event today, he will be the only driver to carry an undefeated streak at a single track across multiple seasons.Goodin Lead: Goodin runs a good line, especially high on the bank. Saito isn’t backing down at all, staying very close to Goodin through the big bank although Saito has a lot of steering corrections and shallow angle. Saito closes the gap from around two cars exiting the bank to less than a car through the entirety of the inner bank, lunging forward several times to keep the gap close and show car control to the judges. Goodin doesn’t make any major mistakes, but the proximity from Saito is likely to lead him to a slight advantage if his steering corrections on the big bank aren’t punished.Saito Lead: Goodin’s car looks down on power as there’s a substantial gap through most of the big bank. Goodin loses drift coming into the inner bank, then drives straight for the final half of the course. Saito gets the unanimous win, keeping his win streak alive. Field Lead: Field is high on the bank with a few small steering corrections on the high bank, Kearney is close in chase and maintains strong proximity through most of the bank, allowing for just enough room for Goodin to transition through the mid-bank. Field has a great line through the mid-bank transition and slides into the inner bank on the proper line, Kearney nips the clipping point midway through the bank but continues with good proximity through the inner bank. Field finishes the course strong, Kearney may not have continued his drift across the finish line and may be deducted points for finishing early. This was a major point of emphasis from the judges, so it will be interesting to see how they treat this. Kearney calls his lone competition timeout to look over the car.Kearney Lead: Both cars are running supercharged motors, although Kearney’s is a V10 compared to Field’s V8. Tons of smoke from both drivers, this is probably one of the faster tandems we’ve seen so far today. Field is three or four car lengths behind Kearney for most of the big bank, but closes the gap up to around two car lengths around the inner bank and surges ahead towards the end of the inner bank to get within a foot or two. Field is given the win. Bakchis Lead: Bakchis has a good angle on the bank, not as high as some drivers but still strong overall. Mohan is a bit lower on the bank and a bit shallower with much less tire smoke, but not the greatest proximity. As both drivers transition through the mid-bank, Mohan takes out the clipping point then closes the proximity as they enter the inner bank. Mohan gets a bit too close and has to back off, losing drift and driving straight through most of the inner bank while Bakchis finishes the course smoothly. Big advantage to Bakchis on this run.Mohan Lead: Mohan again is lower on the bank than the judges would like to see, Bakchis is a few car lengths back in chase, but close enough to still be considered an active chase. Mohan stays safe through the bank and finishes the run smoothly, Bakchis stays a few car lengths back but has more smoke and much more steering angle. No major mistakes for either driver means that Bakchis earns the unanimous decision based mostly on the first run. Pawlak Lead: Pawlak runs the whole course start to finish very smoothly, looking like a top 5 qualifier on this run despite qualifying seventh. Wicknick is midway down the bank on his chase run, likely down on power and possibly having some engine issues. Engine issues kept Wicknick out of Pro 2 competition yesterday, and it looks like they may be rearing their head again. Wicknick is never closer than about 8 car lengths through the entire course, this looked more like a practice run than an actual competitive tandem battle. Huge advantage to Pawlak and possibly a zero for Wicknick. Wicknick calls his Competition Timeout to evaluate the situation with his car.Wicknick Lead: Wicknick pulls to the line with steam emitting from his trunk-mounted radiator, content to run the car as-is and give the fans a show. Unfortunately, the technical manager disagrees with the safety of the car in this configuration, and doesn’t allow him to run. Pawlak takes a solo pass and moves on to the top 16. Hohnadell Lead: Hohnadell manjis into the first corner, while Mordaunt takes a more traditional clutck-kick entry and quickly closes the gap down to a car length. Mordaunt dumps a ton of steering angle to avoid hitting Hohnadell, which pushes his line down the bank. Hohnadell runs the high line around the bank as requested from the judges, Mordaunt slowly slides back to a mid-high line by the exit of the bank. Mordaunt has a few steering corrections through the switchback and has a shallow line and angle through the inner bank. This is a bit of a sloppy run from Mordaunt and Hohnadell likely has an advantage for the second run. Hohnadell called a competition timeout as there is some fluid leaking from the car as he pulls to the line for his second run.Mordaunt Lead: Mordaunt pulls out a five-car gap on the big bank and maintains it through the entirety of the bank, Hohnadell takes out the clipping point at the exit of the bank. Hohnadell transitions a bit late on the inner bank and taps the back end of his car along the wall, which throws the front end of the wall and even gets the front end of the car off the ground. Thankfully, Hohnadell walks away from the car safely, but the car looks a bit battered. Judges vote unanimously for Mordaunt. 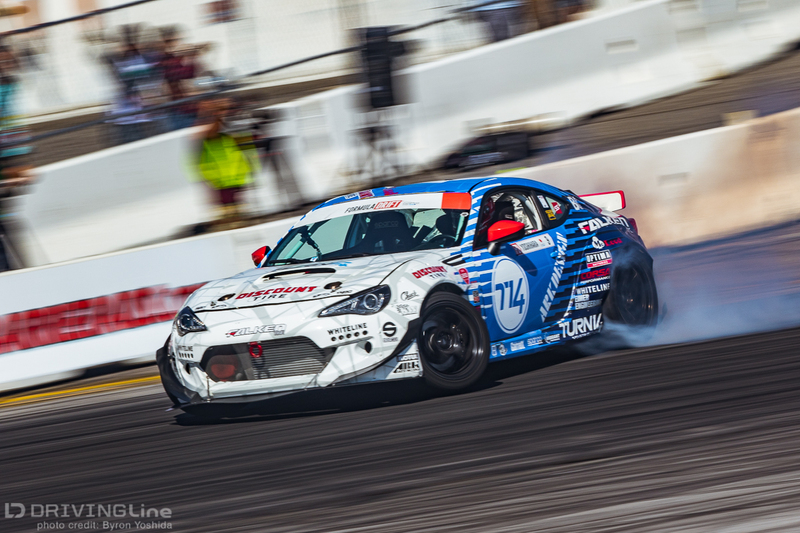 Gushi Lead: Gushi is looking to make a statement as his championship hopes have been dashed by his Scion Racing teammate and initiates high on the bank, while Castro’s initiation looks to be almost in slow motion behind him. Castro’s steering angle is substantially less than Gushi’s on the bank, then Castro has substantially more angle through the switchback which not only slows him down but also takes out the clipping point. Gushi continues his masterful run on the inner bank with tons of tire smoke, while Castro never really applies pressure to Gushi and possibly even finishes his drift before the finish line which would earn him a zero.Castro Lead: Castro again is on a lower line, but has much better steering angle through the big bank. Gushi is just a car length or so behind Castro, mimicking the line well. Gushi closes the gap very quickly across the switchback and there’s some contact entering the inner bank with Castro spinning out. Gushi re-initiates and gets back on throttle to finish the course while Castro drives off. It looks like Gushi caused the contact, which could potentially push this to a “One More Time”. Looking at the replay, it looks like Castro may have over-rotated and been on the verge of spinning out as-is before the contact. Two votes for Gushi, one vote for One More Time send Gushi into the Top 16 round. Yoshihara and Essa are both former champions (Yoshihara in 2011 and Essa in 2013), but both drivers have had a bit of a down season this year as they dial in their cars. These drivers faced off in Seattle earlier this year, with Essa getting the better of that matchup.Yoshihara Lead: Yoshihara starts the run with a good line, but a bit shallow on angle. By midway through the bank, Yoshihara has added more angle, but Essa has closed the gap from around four cars at initiation down to around two cars through most of the big bank. Essa has a fairly large steering correction as they enter the inner bank, while Yoshihara’s steering angle is much more settled. Essa stays around two car lengths away through the entire inner bank, showing good proximity overall despite the small corrections.Essa Lead: Essa has the higher line this time around on the big bank while Yoshihara looks shallow and a bit shaky on his steering angle. Coming into the inner bank, Yoshihara has a major steering correction, somewhat similar to Essa’s chase run but to a greater degree. Yoshihara’s correction appeared to be larger than Essa’s, but could see judges requesting a “One More Time” in favor of a cleaner run. Two judges vote for Essa to move on, while one judge votes for a OMT. Denofa Lead: Denofa has a good clean run, decent tire smoke and good line through both the big bank and the inner bank. Moen has sort of issue midway through the big bank and ends up hitting the wall mid-bank. Moen definitely had some sort of mechanical issue, probably something with a tie rod or something with the steering. Moen is towed off course. Moen is unable to fix his vehicle, Denofa moves on to the top 16 unanimously. Charles Ng is running in Forrest Wang’s former Nissan S14 chassis due to engine issues in his Infiniti G37 stemming from the Texas Round.McQuarrie Lead: McQuarrie running the proper high line through the bank, Ng is a bit lower on the line but good angle and smoke. Ng closes the gap through the middle of the bank, and continues strong. McQuarrie has good tire smoke and angle through the entire run, although he didn’t open up a huge gap, overall his run was likely enough for a small advantage.Ng Lead: Ng has a cleaner run in his lead, but McQuarrie has a better angle with more smoke. Both drivers have good smoke and angle into the infield, Ng opens up a small gap through the mid-bank switchback but McQuarrie starts to close it through the inner bank. Ng finishes the course cleanly, but McQuarrie appears to have finished his drift a few feet short of the finish line. We saw Kearney deducted for that same situation earlier, we will see if the judges determine McQuarrie to have earned a zero. Two judges vote for Ng, one judge votes for a one more time. McQuarrie likely won’t be happy with that outcome. Anna Aguilar sings the national anthem after several new Air Force recruits are sworn in. Drivers are brought out in front of the standing room only crowd, and introduced one at a time. Vaughn Gittin Jr. takes a few laps in his ‘ultimate fun-haver’ F150 truck, including taking it off of a 3-foot launch ramp, and now we’re ready to get rowdy at Irwindale! Wang Lead: Wang again is high on the bank, but Yokoi is just inches behind him! There’s less than a car length in distance between both cars through the entirety of the big bank. Both drivers transition smoothly through the switch-back, Yokoi is just inches from Wang until the inner bank. Wang goes in deep possibly rubbing the wall, but Yokoi’s back end taps the wall and swings the front into the wall as well. Wang continues in drift through the rest of the course finishing strong, Yokoi taps the wall several more times and parks the car midway through the inner bank. Wang will have a clear advantage, Yokoi’s car needs to be towed off course. Yokoi is unable to fix the vehicle during his competition timeout, Wang moves on to the Great 8. These drivers hold four of the twelve championships. Foust has been away from the sport for a few years now, but has looked much better this weekend than at previous events he competed at.Foust Lead: Foust hasn’t lost any mojo on the big bank, riding the high line all the way around with plenty of Nitto tire smoke. Forsberg takes a bit lower line, but has great proximity and dives in on Forsberg as they get to the inner bank. Foust has some left-foot braking on the inner bank, but Forsberg is able to match his angle and speed almost perfectly. Both drivers come off the wall at the right time and hit the inner clip on the infield almost perfectly, finishing less than a car length away from each other. Likely a slight advantage to Forsberg for a great chase run.Forsberg Lead: Forsberg has a very similar line to Foust’s lead run, Foust appears to have entered late but maintains a two-car gap through most of the big bank. Forsberg opens up the gap to around seven car lengths through the switchback, but Foust uses a shallower line to slowe the gap down to around four car lengths. This run definitely looks to be in Forsberg’s favor, Forsberg earns the unanimous decision from the judges. Whiddett Lead: Whiddett has really shown great progress in the RADBUL Miata over the past few events and is much faster than earlier in the season. Whiddett has a great high line on the big bank, and a smooth transition through the switchback while Tuerck is very close through both areas. Tuerck gets a little too close as Whiddett switches back entering the inner bank, ripping the rear bumper off of Whiddett’s car but Whiddett maintains drift through the process. Whiddett and Tuerck finish the inner bank with tons of tire smoke, it appears that Tuerck may have tagged the wall near the finish line. Tuerck is determined to be at fault for the contact against Whiddett, giving Whiddett ‘adequate time’ to inspect and fix any damage despite not losing any drift.Tuerck Lead: Tuerck did in fact tag the wall before the finish line, breaking a control arm in the process. Tuerck and his RETAKS Backpacks team narrowly missed getting the control arm replaced within the 5-minute allotment, handing the win to Whiddett. 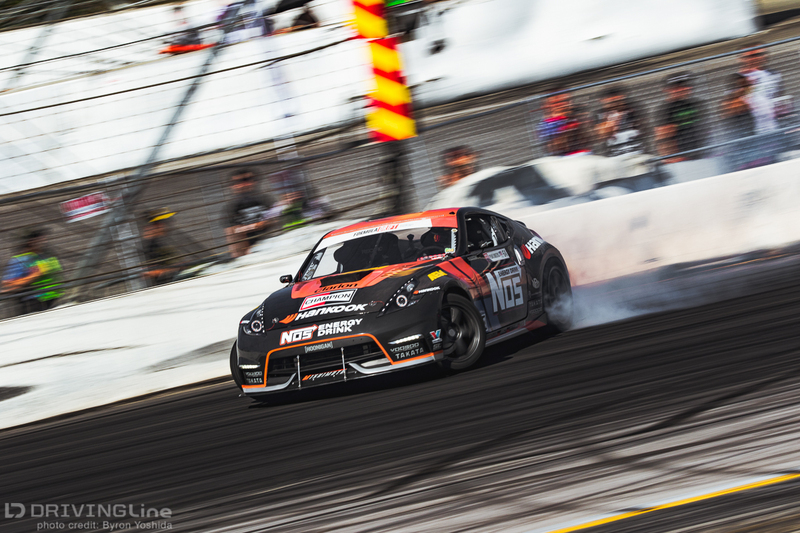 Last year, Aasbo’s championship ended at the hands of Daigo Saito, and Saito knocked Aasbo out of competition in Texas earlier this year, which kept the championship chase up in the air prior to Irwindale. Now that Aasbo has confirmed the championship, this run won’t determine the outcome as it has in previous matchups, but Aasbo is still looking for revenge.Aasbo Lead: Aasbo looks almost robotic in his runs, initiating at nearly the exact same moment on every run, riding nearly the same line on the bank in every run, and just looking very smooth. Saito gets aggressive midway through the big bank and closes the gap from around three car lengths down to around one car length, but has to brake to avoid hitting Aasbo. Aasbo uses that moment to open up a gap on Saito through the switchback, Saito’s line through the switchback looks fairly awkward but he keeps his car on the correct side of the clipping point. Saito has shallow steering angle on the inner bank, but fantastic proximity.Saito Lead: Saito isn’t as high on the bank, but his car is visually much faster than Aasbo’s with tons of tire smoke. Both cars exit the bank with Saito around four cars ahead of Aasbo. Aasbo closes the gap down to around two car lengths on the inner bank, but Saito opens it up to around four car lengths. Saito likely has an advantage from this run, but Aasbo likely had an advantage on the first run for very different reasons. It will be interesting to see if the judges feel that one advantage was larger and deserved the outright win. One vote for Aasbo, two votes for OMT, which means we go One More Time! Aasbo Lead: Aasbo continues to look strong, with a near-flawless run. Saito has incredible proximity through the big bank, but apparently got lost in the smoke as he exits the bank on the wrong line and clearly misses the switchback. Aasbo finishes the run smoothly, but Saito cruises the inner bank, knowing he likely earned a zero for missing the clipping point.Saito Lead: Aasbo looks to be taking it conservatively, often staying four to six car lengths back of Saito. Saito pushes the gap even larger on the inner bank, but then spins entering the infield just before the finish line. Aasbo finishes the course smoothly and get the unanimous decision, although he may have been at risk of an ‘inactive chase’ had Saito not spun. Field Lead: Field has a great high line on the bank, Odi has good proximity but is clearly much shallower both in line and angle with several steering adjustments. Field extends a bit of a lead across the bank switchback, Bakchis attempts to close it down by braking late but Field opens it again through the inner bank. Field used some left foot braking on the inner bank to stay high on the line, but Bakchis used his left foot to brake substantially more and is noticeably shallower in steering angle at all times.Bakchis Lead: Field starts the big bank around three or four car lengths back, but looks much more settled in his steering angle through the bank. Field closes the gap through the switchback and is within one car length through the inner bank. Bakchis slows substantially at times, but Field is able to control his speed and angle well to avoid contact. Judges want to see this tandem pairing again and vote for a “One More Time” run despite one judge voting for Field. Field Lead: Bakchis is shallow both in line and angle through the entirety of both the big bank and the inner bank, with a ton of steering corrections. Bakchis showed big angle through the switchback, but otherwise looked shallow. Field isn’t able to open up a huge lead, but has substantially more angle, especially on the big bank. Ideally, this would result in an advantage for Field, but it seems that the judges aren’t really analyzing the steering angle much this weekend.Bakchis Lead: Bakchis again has shallower angle on the bank and several moments of left-foot braking, but Field has a lower line and isn’t able to make up much ground. Field goes deep into the inner bank, possibly rubbing his rear bumper on the wall. Bakchis dumps a ton of angle near the end of the inner bank, Field has to slow substantially to avoid hitting Bakchis. Bakchis pulls away after the maneuver and finishes the run strongly while Field struggles to maintain drift and allows for a huge gap to open up. This looks like some major gamesmanship from Bakchis, it will be interesting to see how the judges will decide this battle. All three judges vote for another OMT round, and the crowd boos the decision. It seems as though that was a vote more for wanting to see a clean battle than a vote for a sudden death battle due to quality driving by both drivers. Field Lead: Again another consistent run from Field along the bank while Bakchis has several steering corrections on a shallow liner. Bakchis maintains good proximity through the inner bank, albeit with shallower steering angle. If the judges want to see proximity, Bakchis is doing a good job. However, if the judges care about steering corrections and taking a consistent line as they have mentioned at previous events, Field likely has the advantage.Bakchis Lead: Field gets out to a lead from the launch, which isn’t how this run is supposed to go. Bakchis catapults past him, perhaps Bakchis missed a shift. Field is playing catchup through the big bank. Field takes out the switchback cone, then his car catches fire midway through the inner bank. Field has an issue similar to this in practice earlier in the weekend and mentioned this was due to tire debris buildup inside his fender wells, but thought he had the issue cleared up. Bakchis maintains drift through the end of the course and finishes with around a six car gap. On the replay, it looks like Field jumped the start, Bakchis was a bit slow out of the gate but likely not a missed shift. Bakchis gets the unanimous win. Pawlak Lead: Depite both drivers being in the series for several seasons, these two drivers have yet to face each other in tandem previously. Both drivers have some steering corrections on the big bank, but more notably, Mordaunt is notably lower on his line than Pawlak. Pawlak has good angle across the switchback, but Mordaunt takes out the clipping point with his front bumper. Pawlak again has the higher line on the inner bank, but Mordaunt closes the gap a bit towards the end of the run. Pawlak likely has an advantage, but not the smoothest run from either driver.Mordaunt Lead: Mordaunt starts the big bank with a four or five car lead, but Pawlak closes it up by the exit of the big bank. Pawlak takes out the clipping point on the switchback much like Mordaunt did on his lead, but then Mordaunt spins on the inner bank. Pawlak passes by Mordaunt maintaining drift, then does a celebratory 360 after the finish line, right in front of the crowd. Pawlak gets the unanimous win. 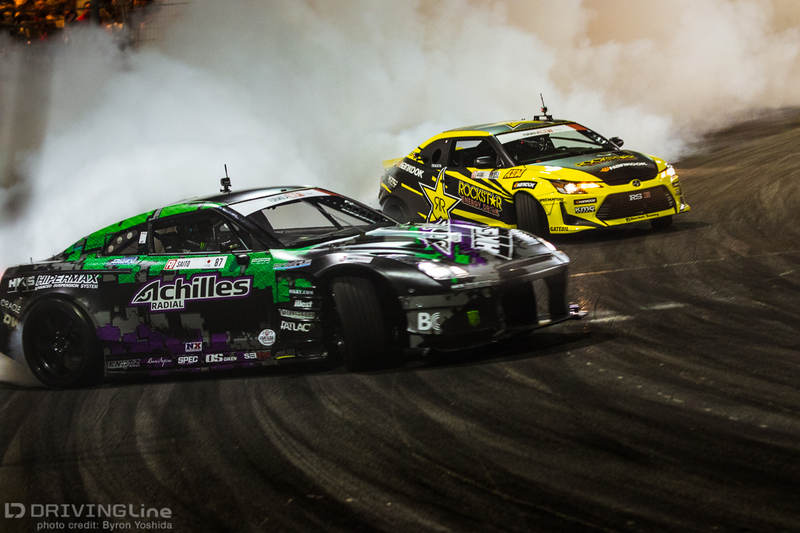 Interesting note: Gushi is one of only three drivers who have attended every single Formula Drift event to date, joining Daijiro Yoshihara and Chris Forsberg in that company. Notably, Gushi is the only one of that group who has yet to win the championship.Gushi Lead: Gushi has looked solid all weekend, he likely could win the event. Gushi runs a great line on the bank, Essa is around three car lengths back on the big bank. Essa takes out the clipping point on the switchback, then spins on the transition to the inner bank. Gushi maintains drift through the remainder of the course.Essa Lead: Essa rubs his bumper near the exit of the big bank, overall having a shallow line until the exit of the big bank. Gushi is off line on the mid bank transition and is shallow on the inner bank, but keeps the car in drift and on the track. Gushi earns the unanimous decision thanks to Essa’s spin on the first run. Denofa Lead: Both drivers are a bit lower on the bank than preferred, but run the bank cleanly. Transitioning into the inner bank, Ng has shallow angle, closes the gap a bit on Denofa but then hits the inside clip on the infield after the inner bank. Denofa has a clean run, not the best line of the day but definitely the cleaner run. Denofa has called his competition timeout.Ng Lead: Ng initiates as expected but Denofa drives straight through most of the big bank. Exiting the bank, Ng is on line with plenty of angle, but Denofa is driving straight on the wrong side of the switch-back clipping point. Ng finishes the course strong with plenty of tire smoke, but Denofa is clearly having mechanical issues. Ng gets the unanimous win. Wang Lead: Wang initiated then immediately got on the brakes. Forsberg expected a different initiation and was tight on him, but appears to have been able to avoid contact. Forsberg ends up on a lower line through most of the bank likely due to having to slow so much after initiation, but gets back on proximity to Wang as they get through the switchback. Wang continues to have great angle on the inner bank, Forsberg closes the gap and again comes awkwardly close to hitting Wang but again appears to have avoided contact. Both drivers finish without a hitch. Wang has called his competition timeout.Forsberg Lead: Forsberg is a bit lower on the bank than Wang was, Wang has good proximity. Forsberg opens up a bit of a gap on the inner bank, but Forsberg closes it again before the infield transition. This seemed like a bit of a safe run compared to how aggressive Forsberg was on his chase, it will be interesting to see whether the judges reward the conservative and consistent approach or the jerky, aggressive approach. Judges vote unanimously for Wang, apparently slow and steady wins this race. Whiddett Lead: Whiddett continues to run one of the highest lines on the big bank, Aasbo is three or four car lengths back through most of the bank. Aasbo closes the gap a bit through the switch back but still well behind Whiddett for most of the inner bank as well. As Whiddett slows to ensure he fills the outer zone towards the end of the inner bank, Aasbo is finally able to catch up a bit. Unfortunately, Whiddett is unable to maintain drift across the finish line, which will likely earn him a 0 for the run.Aasbo Lead: Aasbo initiates fairly early on the bank, and keeps a good line, while Whiddett is a few car lengths behind. Whiddett appears to get lost in the smoke again and takes out the clipping point at the switchback. Whiddett closes the gap a bit on the inner bank, Aasbo finishes strong, but the mistakes are likely too much for Whiddett to make up. Aasbo gets the unanimous win. Pawlak Lead: Bakchis has looked shaky all night, with some major steering corrections especially on the bank, and this run is no different. It seems like the judges must not be seeing what we are seeing. Pawlak has a great lead run, high on the bank, with smooth steering inputs, while Bakchis has several corrections, with shallower angle, on a lower line. It seems like Pawlak would have an advantage, but Bakchis has moved this far in the competition despite his lower line and major steering corrections, so there’s no saying what might happen.Bakchis Lead: Pawlak initiates around three cars back of Bakchis, but closes the gap down to a single car by mid bank. 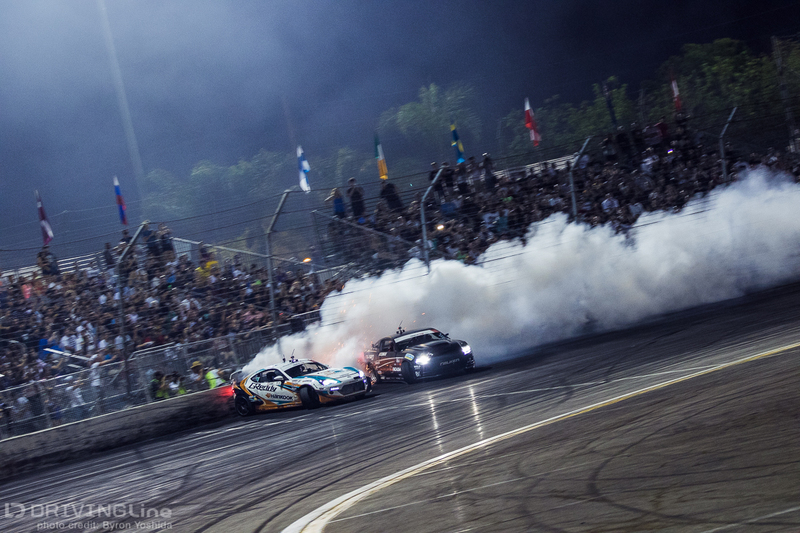 On the inner bank, Pawlak shrinks the one car gap into a gap of just inches, almost nudging Bakchis in the process. The proximity is incredible, and overall, Pawlak looked very consistent ant calculated on both runs. Pawlak earns the win and moves into his second Final Four of the season. Gushi Lead: Much like Aasbo, Gushi has looked almost mechanical all weekend with his high line on the bank and plenty of tire smoke. Ng is on a slightly lower line, but with good steering angle. Ng scrubs a lot of speed through the switchback, and loses a lot of ground to Gushi. Ng takes the shallower line through the inner bank and catches up to Gushi near the finish line, but Gushi’s run was clearly much smoother.Ng Lead: Gushi has several moments where he closed the gap, then had to back off. Unfortunately, one of these moments after the switchback may have bumped Ng. Ng pulls away with a three car gap around the rest of the inner bank. Replay shows that Ng had a major e-brake pull coming into the inner bank, which may have induced Gushi into tapping Ng. Judges vote unanimously for Gushi. As the top qualifier in the Final 4, Wang is guaranteed a podium position at this point.Wang Lead: Wang continues to look strong, although on a bit lower line than on some of the previous runs but with good smoke and steering angle. Aasbo dives in after the switchback and is very low on the inner bank although not off-course. The shallow steering angle and lower line on the inner bank from Aasbo should give Wang an advantage.Aasbo Lead: Aasbo opens up a fairly large lead on the big bank, around five or six cars. Wang uses the switchback to close the gap a bit to around four car lengths, but maintains really good line and angle. Traditionally, Wang’s approach is more in the spirit of drifting, while Aasbo’s line has become the epitome of the American iteration that emphasizes proximity over all other measurements. Aasbo takes the win despite the differences in approach from both drivers. The loser of this battle will automatically end up as 4th place due to Wang having the higher qualifying position.Gushi Lead: Both of these drivers have had excellent runs on the big bank all weekend. This time, Gushi has a good lead run but Pawlak is on a shallower line with minimal steering angle for the first half of the bank. Pawlak finally gets it sideways near the end of the big bank, Gushi takes out the course marker on the switchback, then enters the inner bank too hot and slides into Gushi who then hits the wall. On the replay, we see that Pawlak attempted to push more angle out of his Ford Mustang before hitting Gushi, definitely attempting to avoid the contact. 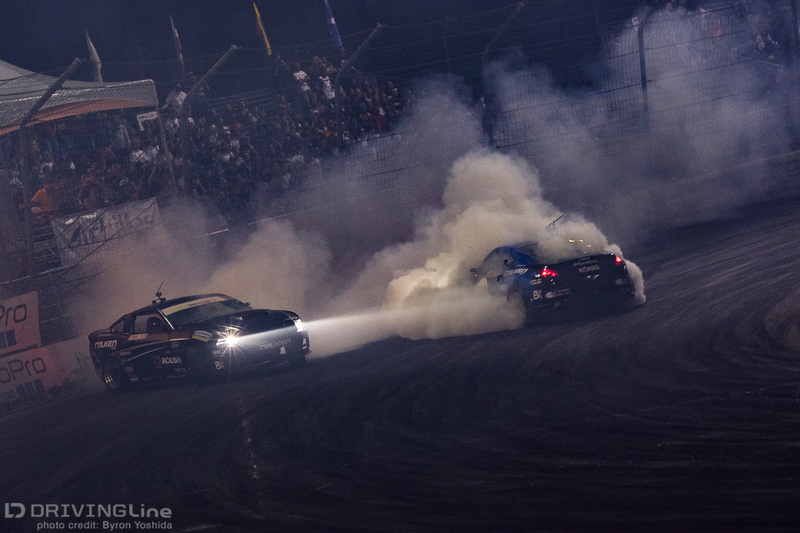 Fault is placed on Pawlak due to initiating contact, giving Gushi an opportunity to look over the car if needed. Gushi doesn’t take that opportunity and pulls up to the line immediately, wanting to finish the battle as-is. Formula Drift’s technical manager demands that the team take a second look at the car, but the car is cleared and Gushi brings the car back to the line for the second battle of tandem.Pawlak Lead: Gushi starts the bank around four cars behind Pawlak, possibly playing it a little safe due to the contact. 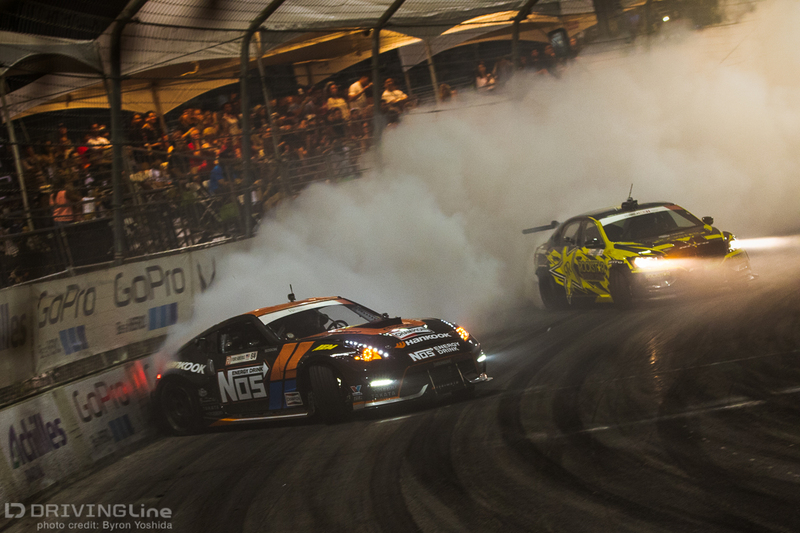 Coming into the inner bank, Gushi maintains around the same gap with good angle and tire smoke. Pawlak runs the course as if it were a qualifying pass, brushing the inner bank wall and looking solid overall but unlikely to be enough to overtake Pawlak. On the replay, it looks like Gushi actually shut the car down a bit before the finish line, which caused several drivers to lose their tandem battles earlier, including Tyler McQuarrie and Dean Kearney. Two judges vote for Gushi while a third votes for a OMT. As luck would have it, the two top finishers in the championship would face in the final round. While this has no standing on the final championship rankings, this is definitely for bragging rights amongst the Scion Racing team. We have a decision! The drivers are brought in front of the big crowd for the announcement. 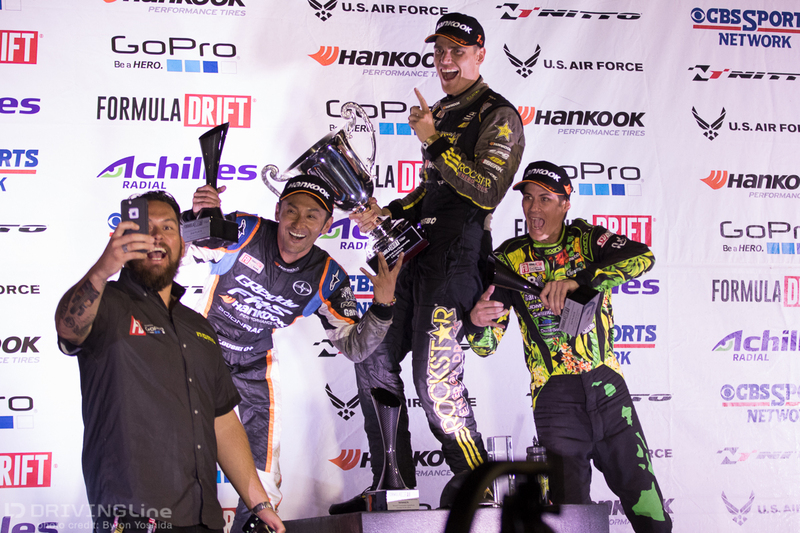 The drivers give each other a high five, Aasbo gets the win and caps off a near-perfect weekend! 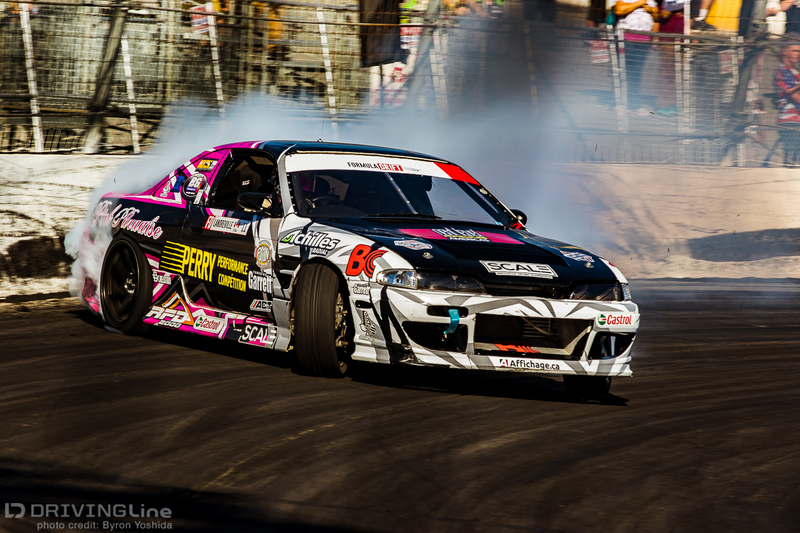 Event winner, Formula D USA series champion, and also inaugural Formula D World Champion! 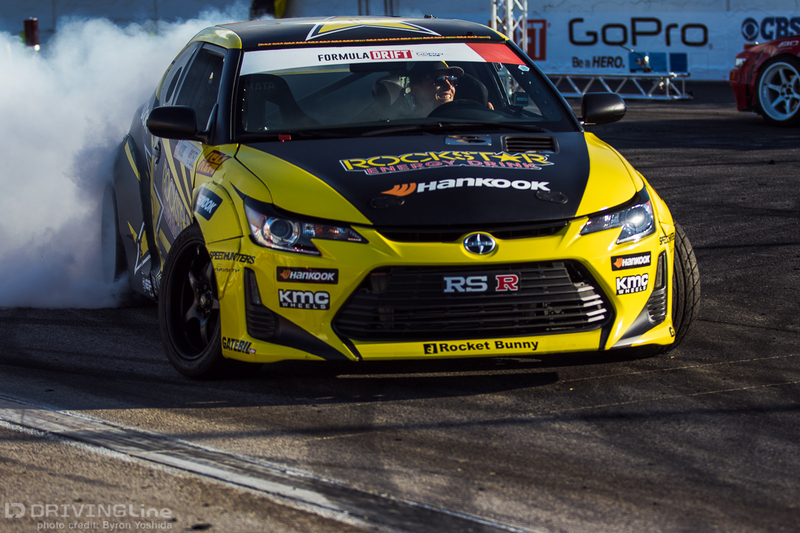 Congrats to Fredric Aasbo and his Scion Racing/Papadakis Racing team on their accomplishments for the season.